US, 1958, 98 minutes, Black and white. Lana Turner, Barry Sullivan, Glynis Johns, Sean Connery, Sidney James. Another Time, Another Place is a '50s soap opera. It is a star vehicle for Lana Turner who looks most glamorous as an American war correspondent in England in 1945 and who suffers with great dignity. Barry Sullivan is a reliable lead. Glynis Johns is a devoted wife. However, the film introduces Sean Connery who performs with presence and assurance. However, he dies early in the film. The film has the flavour of London during the war, the peace of the English countryside. It highlights the theme of wartime romances and their repercussions on individuals and families. However, basically the film is a pleasant soap opera. 1. The appeal of this romantic drama? Soap opera? A drama of regrets? 2. British production, black and white photography, the period? The stars, the cast and its strength? 3. The title, the focus (in war, on what might have been? Audiences' emotional rather than head response? 4. The war, the work of the correspondents, press and radio, seeing them at work, the Americans in Britain, the British, dangers, death? 5. 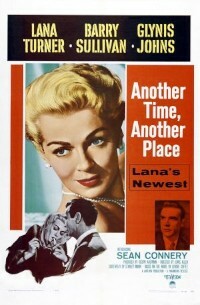 Lana Turner and her style as Sarah? Her work, the encounter with Mark, falling in love, decisions, her being shocked at the truth, hurt, being together as he went, the effect of his death, her collapse? Her relationship with her editor? His coming to England? In hospital? Her decision to make the journey? the chance encounter with Mark's wife and son? Staying, the friendship, sharing the grief, the decision to make the book of his broadcasts? Alan's arrival, the truth? The editor's arrival, the pretence? Sarah's decision to tell the truth, the hurt, the reconciliation at the train? Her telling Mark's wife a lie at the end? 6. Mark and his charm, his life, love, marriage, family, the effect of the war, decision to leave his wife, the lies to Sarah, telling her the truth, with her before he went, his death and its effect? 7. Mark's wife and son, at home, the grief, Sarah's arrival, friendship, Alan's arrival, her suspicion, grief, wanting the truth, hearing it, her anger, the reconciliation at the end? The boy, his friendship, nightmares, Sarah's presence in the house? 8. Alan and his friendship, discretion, covering up? 9. The editor and his relationship with Sarah, coming to England, seeing the truth, going to Cornwall, influencing her? 10. The background of war correspondents, the newspaper, the staff (Sid James in a serious role)? 11. Realistic situations presented in a melodramatic and romantic way?